ASQ Family Access makes it easy for families to complete their questionnaires in in the comfort of their own homes or other convenient settings. ASQ® Family Access is a user-friendly tool that allows parents to complete questionnaires online, through a secure, customizable website that integrates seamlessly with your ASQ® Pro or ASQ® Enterprise account. Family Access is available to all ASQ® Online users as an add-on annual subscription for $349.95 per year. Learn more. Many ASQ Online customers are already using Family Access to enhance screening and identification efforts in their individual practices or the larger community. Conducting and scoring the ASQ has always been simple and straightforward, but Family Access makes it even more so. Dr. Henyon is a pediatrician with Bozeman Deaconess Pediatrics in Montana. The practice began offering Family Access in 2010 to accommodate their growing dedication to performing thorough developmental screenings. Instead of waiting for forms by mail, or answering screening questions during a home visit or in your office waiting room, families can now complete the questionnaire quickly and on their own terms. All they need is a home computer, tablet, or smart phone with Internet access. The convenience of Family Access also makes it an ideal tool for expanding access to developmental screenings—a bonus for organizations like Pretend City Children’s Museum in Irvine, CA. Along with offering an exciting play and learning experience in the form of 17 kid-sized interactive exhibits, Pretend City is dedicated to educating parents and caregivers about healthy child development. Their “Good to Go from Head to Toe” initiative, now in its fifth year, offers free ASQ screenings to Orange County residents. Now you can direct parents to your customized Family Access website instead of spending time and postage mailing paper questionnaires—or even more time-consuming, having them complete forms in the office. The system will determine which questionnaire interval to use based on birth date information entered by the parent. And since screenings completed through Family Access are scored automatically, you’ll save another 2–3 minutes for each one you don’t have to score by hand. For busy professionals, a few minutes here and there sure can make a difference over time! “As a provider, I feel this is a great service for our patients and for my ability to track a child’s development in a much more accurate fashion than the simple questions I would ask prior to using ASQ,” explains Bozeman Deaconess Pediatrics’ Dr. Henyon. And what about the answers themselves? Some ASQ users have expressed concern about the validity of online questionnaires as compared to the written versions. No reason for concern, a recent study found: results from paper-pencil and web-based screenings can be considered equivalent. Family Access also eliminates one of the more common roadblocks that arise from paper forms: missed questions. 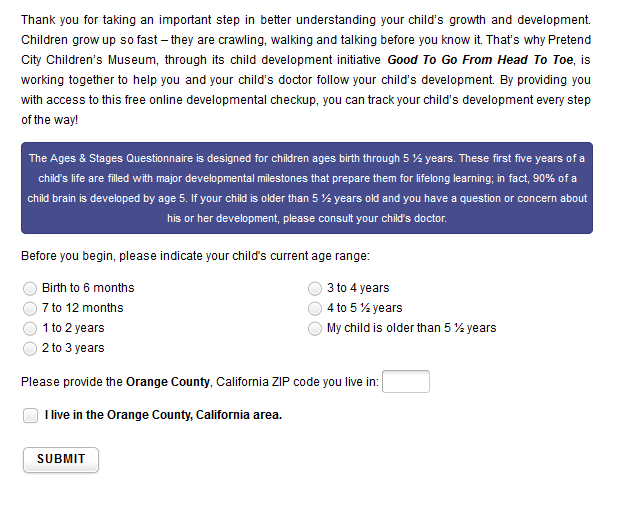 The online questionnaire doesn’t let a parent accidentally skip a question, which makes scoring easier and more accurate. To err is human, as the saying goes. Family Access brings the reliability of automation, scoring questionnaires upon submission and eliminating the possibility of hand-scoring mistakes. And thanks to strict security and data encryption protocols, parents can be assured that the system will keep scores and other personal data safe and sound. Family Access integrates with ASQ Online accounts, whether you’re using ASQ Pro for single-site programs, or ASQ Enterprise for an organization with multiple sites. The only set-up required is to customize your secure Family Access website, adding your own logo and contact information and tailoring the welcome and thank you pages. 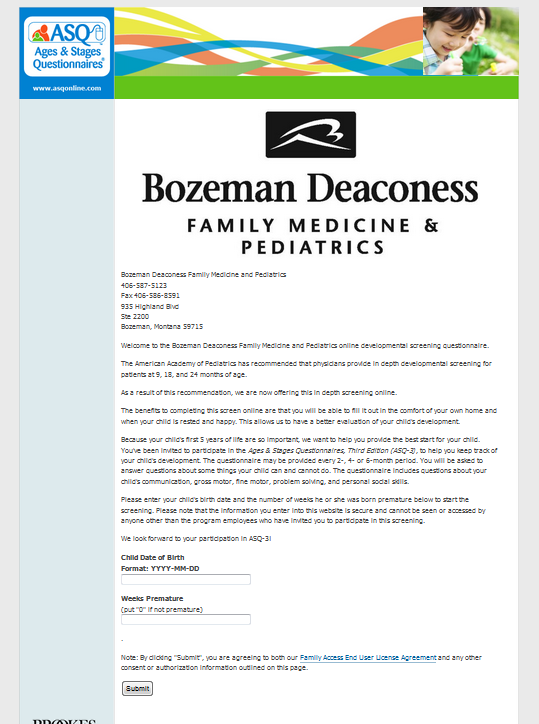 For private practices like Bozeman Deaconess Pediatrics, making Family Access a part of the process is a breeze. They link from the clinic website straight to their customized Family Access page, and ask parents to go on and complete the questionnaire before an upcoming well-child check. A staff member accepts incoming completed questionnaires, and the results appear in the patient’s ASQ Online profile. The scored questionnaires are reviewed by the pediatrician the day of a child’s appointment before going into the patient room. Then, the results are discussed with the family. Because they serve a broader audience, Pretend City’s Family Access site took customization even further and set up a separate entry page that pre-screens participants for geographic and age eligibility before they can access the questionnaire. Once completed, parents are contacted with results and recommended referrals, if necessary. Your Brookes Publishing regional representative can guide you on how to integrate Family Access in a way that streamlines your screening program and addresses your organization’s goals. Once it’s up and running, using the tool is as easy as sharing the URL. And if you have any questions, free email support is available 24/7. “Our staff reports that the customer service email support is fabulous. They get back to us in a timely fashion and do a great job ‘closing the loop,’” says Dr. Henyon. Ready to discover how ASQ Family Access could benefit your organization? Contact your regional sales consultant to see a live demo and get your questions answered.